Celebrate the pleasure of reading and the thrill of discovering new titles in an extraordinary book that’s as compulsively readable, entertaining, surprising, and enlightening as the 1,000-plus titles it recommends. Covering fiction, poetry, science and science fiction, memoir, travel writing, biography, children’s books, history, and more, 1,000 Books to Read Before You Die ranges across cultures and through time to offer an eclectic collection of works that each deserve to come with the recommendation, You have to read this. But it’s not a proscriptive list of the “great works”—rather, it’s a celebration of the glorious mosaic that is our literary heritage. Flip it open to any page and be transfixed by a fresh take on a very favorite book. Or come across a title you always meant to read and never got around to. Or, like browsing in the best kind of bookshop, stumble on a completely unknown author and work, and feel that tingle of discovery. There are classics, of course, and unexpected treasures, too. Lists to help pick and choose, like Offbeat Escapes, or A Long Climb, but What a View. And its alphabetical arrangement by author assures that surprises await on almost every turn of the page, with Cormac McCarthy and The Road next to Robert McCloskey and Make Way for Ducklings, Alice Walker next to Izaac Walton. There are nuts and bolts, too—best editions to read, other books by the author, “if you like this, you’ll like that” recommendations , and an interesting endnote of adaptations where appropriate. 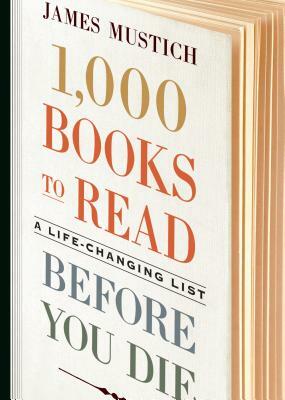 Add it all up, and in fact there are more than six thousand titles by nearly four thousand authors mentioned—a life-changing list for a lifetime of reading. James Mustich began his career in bookselling at an independent book store in Briarcliff Manor, New York, in the early 1980s. In 1986, he co-founded the acclaimed book catalog, A Common Reader, and was for two decades its guiding force. He subsequently has worked as an editorial and product development executive in the publishing industry. He lives with his wife, Margot, in Connecticut. ★"Every so often, a reference book appears that changes the landscape of its area of focus. In the case of reading and readers' advisory, this is one such book....lively, witty, insightful prose...It might be wise to invest in several copies of this wonderful meditation on life lived with and enhanced by the written word." "As the owner of a 90-year-old bookselling institution, I am not easily fazed by 1,000 books, but Mustich’s literary bucket list stopped me in my tracks. His expansive scope is coupled with a delightful wit and a perfect eye for the surprise detail. Never again will you have to wonder what to read next. A book you’ll cherish for a lifetime!" "Chief among the thousands of pleasures here is the delightfully erudite company of James Mustich. Look up your favorite books; find ones you don’t know; argue about the list with friends. Read!" "James Mustich’s book is aimed at a society engulfed in words but desperately poor in the talents that reading can bring—judgment, taste, empathy, wit. The book is not a list of canonical works, though many classics are listed and lovingly described. No, the “1000 Books to Read” is an invocation of the pleasures to be had from many kinds of books—genre fiction, journalism, poetry, history, and memoir, the good and the great, the illustrious and the semi-forgotten, all summoned by Mustich’s taste. You open it at any point and jump from author to author; you follow his hints and read related works by other writers, and you find your own taste emerging, proud and strong, from Mustich’s provocations. 1,000 Books is surpassingly useful as well as good." "If you’ve ever doubted that books were the greatest invention of all time, and that they carry within them our collective memories and dreams, as well as any semblance of intelligence we have as a species, pick up James Mustich’s 1,000 Books to Read Before You Die and start reading." "If I were as erudite, entertaining, insightful, and articulate as James Mustich, I could come up with 1,000 reasons to get his book. But here's one: Whether you're looking for something to read for personal edification or fun, for escapism or relevance, you can survey the literary world with Mustich as an experienced, enthusiastic guide. His work is an essential resource for anyone anywhere plagued by that infernal question: What do I read next?"